Getting outdoors is an important part of our American heritage and fosters a lifetime of awareness and appreciation for wildlife and the environment. 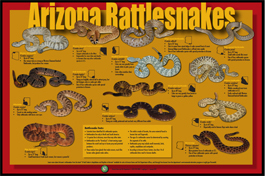 Download the 13 species of rattlesnakes in Arizona e-poster, print it out and put it on your wall, share it online, or just enjoy the facts, and wild information! The Department and supporting organizations continually create outdoor programs for the beginner to seasoned sportsmen that teach families about traditional American pastimes. These programs include hunting, fishing, shooting sports, wildlife viewing, boating, off-highway vehicle riding and wildlife conservation. 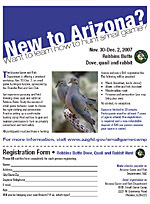 Below is a listing of the many programs offered for your enjoyment, so Get Outside Arizona. Whether you prefer lakes, streams, creeks or urban fishing, a year-long season and a wide variety of sport fish species provide Arizonans with plenty of great fishing opportunities. More than half of all households now own firearms, yet accidental fatalities are at an all-time low–down 60 percent over the last 20 years. For decades, the firearms industry has emphasized education to ensure the safe and responsible use of its products. This effort and those by other organizations are why the shooting sports and hunting are rated among the safest forms of recreation. Some 40 million people of all ages safely participate in these activities. Target shooting improves fine motor skills, hand-eye coordination, mental discipline, personal responsibility, and character development.